What Is Rosacea? What Does Rosacea It Look Like? Ever experience intense cheek flushing that leaves your face hot, red, and inflamed? Does your skin constantly break out into tiny red bumps? Are the blood vessels on your cheeks and nose constantly visible? If any of these sound familiar, you may be battling a common — and extremely frustrating — skin condition called rosacea. Rosacea (pronounced roh-zay-sha) is a chronic skin disorder, and it’s characterized by extreme redness, irritation, and inflammation of the skin. It’s a common but somewhat mysterious condition. Curious why people get rosacea, and how they should treat it? Read on! According to the National Rosacea Society, (NRS) rosacea is believed to affect more than 16 million Americans. Although this high number means it’s a common condition, it’s not very well understood. Plus, most people who have rosacea don’t even realize they have it! A survey conducted by the NRS discovered that 95% of patients knew very little or nothing about the signs and symptoms of rosacea before they were diagnosed with the condition. What we do know about rosacea is that it appears as erythema, or redness of the skin, typically on a person’s cheeks, chin, forehead, and nose, but it can also show up on your chest, ears, neck, and scalp. Of course, we all have a tendency to turn red when we’re hot or embarrassed, but those that have rosacea have redness that appears constantly — even when no obvious factors (like harsh sunlight or a social faux pas) are present. Over time, rosacea tends to become more persistent, meaning the symptoms of redness are constantly present, and this causes blood vessels to appear on the surface of the skin. Those with rosacea tend to have water, irritated eyes as well. If rosacea is left untreated, patches of tiny bumps and pimples can develop and, in extreme cases, may lead to rhinophyma, or bulbous nose. Unfortunately, there’s no singular known cause of rosacea. 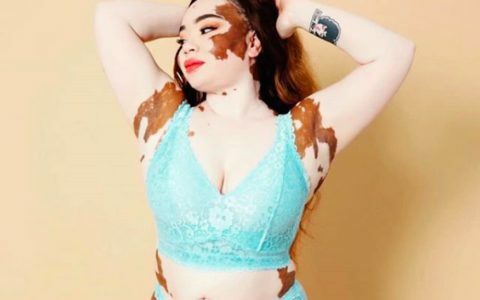 It is believed that people with pale, fairer skin have a higher risk of having rosacea — namely those with Irish, English, Scandinavian, Scottish, Welsh or Eastern European heritage. The condition tends to affect those who blush or flush red more easily. It’s also believed that genetics play a role. Even though the actual cause of rosacea isn’t known, what is understood about the condition is that it’s experienced in waves or flare-ups. These flare-ups are often a result of triggers. What that means is that internal and external factors can increase the likelihood of a rosacea-prone person to turn red or flush. Some common triggers include exposure to the sun, hot or cold weather, wind, heavy exercise, hot baths, heated beverages, alcohol, spicy foods, certain skin care products, and physical or emotional stress. When it comes to skin care products, there are certain ingredients that are known to trigger rosacea, and those include alcohol, witch hazel, fragrance, menthol, peppermint, and eucalyptus oil. It’s also best to avoid astringents and exfoliants and look for products that are formulated specifically for sensitive skin. 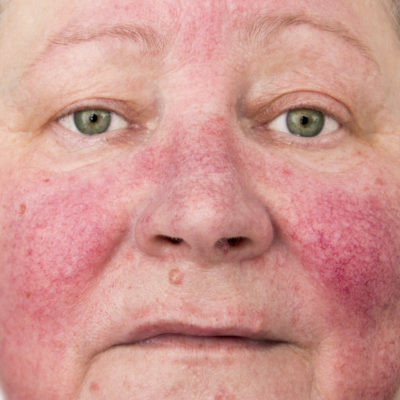 How does rosacea affect those who have the condition? Aside from the obvious redness in a person’s face, rosacea can also have a significant emotional and psychological impact on people who suffer from the condition. 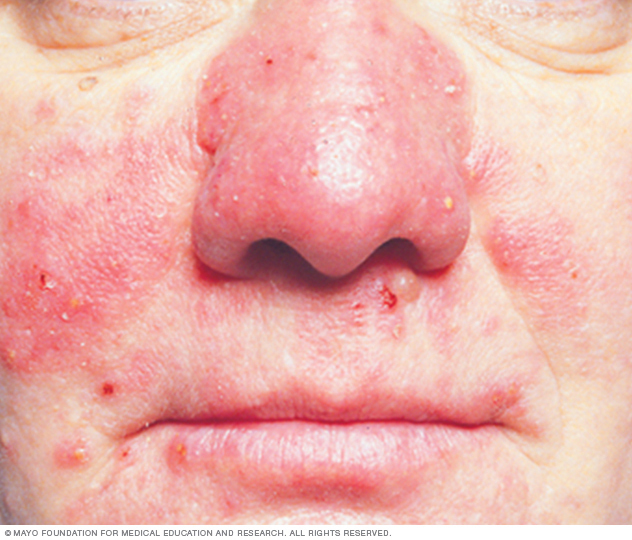 In other NRS-conducted surveys, over 90% of patients with rosacea reported that the condition “had lowered their self-confidence and self-esteem.” Another 41% told surveyors that rosacea “had caused them to avoid public contact or cancel social engagements.” In a survey of patients with severe rosacea symptoms, 88% said that the disorder had “adversely affected their professional interactions,” and 51% said they had missed work because of a rosacea flare-up. It’s also common for those with rosacea to concurrently experience seborrheic dermatitis. If I have rosacea, do I need to see a doctor? Yes! 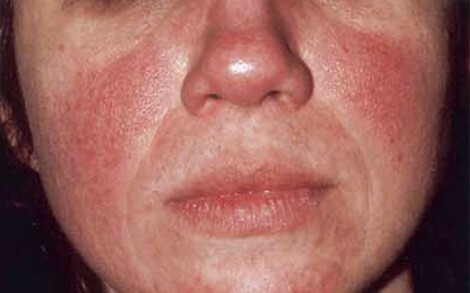 Rosacea can develop at any time of your life, but it’s more common in people who are older than 30. It starts as frequent flushing that feels like blushing or even sunburn and increases in length, intensity, and frequency over time. The frustrating thing with rosacea is that it can worsen significantly over time if it’s not treated, so if you have a suspicion that you’re experiencing the condition, book an appointment with your dermatologist ASAP. There’s no specific test to determine you have rosacea, but a dermatologist will talk to you and do an extensive examination of your skin to determine whether you have the condition. Even if your redness turns out not to be rosacea, it may be another condition, so it’s important to get a professional assessment and diagnosis. How will they help me treat my rosacea? Is there a rosacea cure? Sadly, the condition has no known cure right now, but it can be managed thanks to a combination of topical and oral medications. 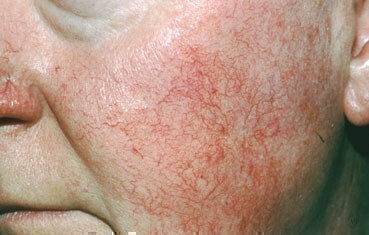 Rosacea is a varying condition, therefore your skin may need to be treated differently than someone else with rosacea. It’s best to work closely with an expert and/or dermatologist to find the best treatment that works for you — and that may include some trial and error. The common symptoms of rosacea that can be treated are severe redness and flushing (called erythematotelangiectatic rosacea), bumps and pimples (called papulopustular rosacea), thickening of the skin (called phymatous rosacea), and/or eye irritation (called ocular rosacea). Depending on which of these subtypes of rosacea you experience, your doctor will likely prescribe oral and topical therapies. According to research by the AAD, the sun is the number one cause of rosacea flare-ups, therefore wearing ample sunscreen (no matter what the weather is!) and avoiding direct sunlight are the best ways to help your rosacea. Brimonidine gel and oxymetazoline hydrochloride cream are two of the common treatments for redness and flushing. Laser treatments and intense pulsed light (IPL) therapy can be used to remove visible blood vessels, reduce extensive redness or correct disfigurement of the nose. If you have eye symptoms, your doctor will likely prescribe oral antibiotics and ophthalmic therapy. 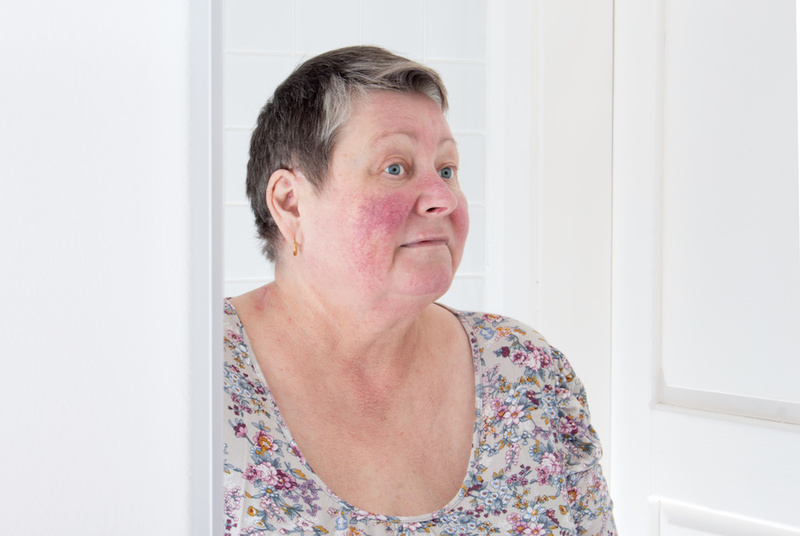 As we explained previously, people with rosacea can experience the condition differently, so what may trigger one person may be fine for another. Doctors often recommend keeping an in-depth lifestyle and food journal to keep track of diet, activity and stress factors — and when rosacea flare-ups happen throughout the day. This type of tracking can help you discover your triggers… and the things you can do to help calm your skin! In fact, a survey of more than 1,200 rosacea sufferers by the NRS found that 96% of those people who had figured out at least one of their personal triggers reported that avoiding those triggers had actually reduced their flare-ups! What skin products could help treat the bumps and pimples? Thx.